SIRAHA, July 28: ‘Eco-tourism’ is a buzz word in Golbazar Municipality these days. The wetland around Lamamada forest at the base of a Chure hill have caught the attention of concerned stakeholders. The provincial and local governments, locals, district forest office and the municipality office have jointly been working for eco-tourism by conserving the wetlands. “The local and provincial governments have established a fund for this. Technological support is there. There is enthusiastic participation of the people,” said Sunil Kumar Singh, an officer at the district forest office. “The aim is to develop eco-tourism through the wetlands we have. This effort will help in conserving the nature and bringing prosperity here,” he added. 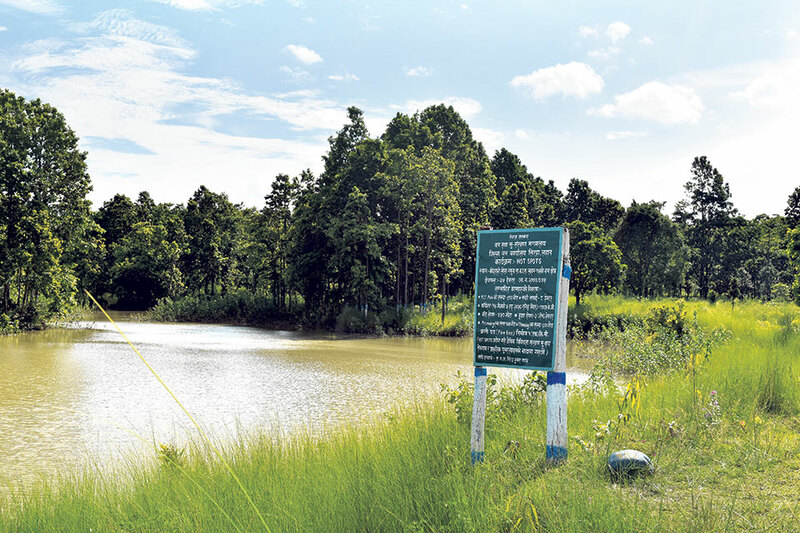 Around Rs 2.2 million is being invested for the wetland. Buddha lake, which is another attraction of the area, is also being renovated. “We are trying to give it all a natural, yet modern look,” said Singh. “From here, it is possible to watch the life of the creatures that thrive in the wetland. Chure’s beautiful sight is another attraction. The jungle area makes it so alluring,” he added. Promoting tourism was one of the agenda items included by political candidates in their election manifestos during the elections last year. Post-election, lawmakers talked about it in the parliament several times. Now, the plan is being implemented, Singh added. “We are gearing up to conserve the wetland. Then, we can revitalize our lost water sources which will have beneficial effects in this zone,” he said. Stating that conserving the wetland will gradually bring back the lost glory of the Chure range, he further said that such activities must be extended to other areas as well. Chure’s massive destruction in the last few decades is considered to be the main reason behind the deteriorating environment in the hills and the plains. Reports claim that water sources have dried up dramatically, affecting agriculture. Wildlife has been greatly disturbed due to the loss of greenery. Conservationists have long been warning that delay in conserving Chure could bring a serious disaster. Following alarming signs and reports about Chure, the government took the initiative to stop the widespread destruction of the region. However, this had not been effective. When the country was adopting federalism, the leaders from Province 2 had made tall promises on Chure conservation. Later in the parliament, Chure became one of the main subjects of discussion. Now, this step of the government to conserve the wetland has been seen as a positive sign which has been applauded by all quarters. “Chure has become barren. The hills have become very fragile. Even little rain washes away the land into the water. To stop all these, we need to take serious steps,” said Singh. “Landslides and floods have become much more unpredictable and frequent of late. This is also due to the destruction of Chure,” he added. According to Singh, conservation work is going on at around 60 hectors of land in Lahan - 15. In some parts, plantation was done recently. Similarly, bushes and unwanted plants have been cut off. “There are temples. Those are being renovated. New routes are being opened to make it easy for the visitors. We want to attract both domestic and international tourists,” said Singh, adding that religious tourism will go along. Rajdevi temple is already a famous religious site here. During special occasions, it draws a huge crowd. Every Saturday, locals throng to the temple, while in other festivals, people come from several other parts as well. Singh further mentioned of boating. After the ponds and lakes are cleaned up in the targeted areas, boating service will be operated for visitors, he said. “Once the cleaning and maintaining of this area is done, the work for garden and park will begin. All the wards, members, locals are for it and there is no dearth of budget either,” Singh said. According to Singh, the entire project will be completed within this fiscal year.